There was no lack of interesting games this round. The round ended with loss of the undefeated team, favorites losing the games, games ending by tiny margin and even winless team recording their first victory. Here is the last round review presented by ESL. The most surprising game was the first loss of OS Arreridj (3-1) at the home court on Sunday night. Hosts were defeated by ninth ranked USM Alger (2-2) 62-54. It ended at the same time the three-game winning streak of OS Arreridj. USM Alger moved-up to eighth place, which they share with US Setif. OS Arreridj at the other side keeps the third position with one game lost. Important game to mention about took place in Setif. Eighth ranked USS (2-2) saved a 3-point victory at home edging 7th ranked Staoueli (2-1) 85-82 on Sunday evening. USS maintains eighth place with 2-2 record, which they share with USM Alger. Staoueli at the other side keeps the seventh position with one game lost. Very important is a home loss of second ranked CRB Dar El-B. (3-0) against leader GS Petroliers (2-0) on Sunday night. Host CRB Dar El-B. was crushed by GS Petroliers in El-Beida 77-57. It ended at the same time the three-game winning streak of CRB Dar El-B.. Defending champion maintains fourth place with 2-0 record, which they share with WO Boufarik and NAH Dey. Loser CRB Dar El-B. keeps the second position with 0 game lost. USMB has registered their first victory this season after three consecutive losses. They used home court advantage to defeat El Eulma (0-3) 71-66. USMB (1-3) left bottom position moving up to eleventh place, which they share with Olympi Miliana and Rouiba CB. It was El Eulma's third loss in a row. They still close the standings with three games lost. 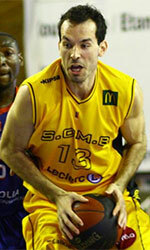 Bottom-ranked Olympi Batna managed to get a 0th victory, breaking the series of four consecutive losses on Sunday night. They won against tenth-ranked Ouargla 73-62. And what about a 0th win in a row after ...four consecutive losses. Olympi Batna maintains sixteenth place with 0-4 record. Loser Ouargla keeps the tenth position with one game lost. There were no shocking results in the rest of the games of round 5: Olympi Miliana lost to undefeated IRB Arreridj on the opponent's court 60-73. WO Boufarik outscored Rouiba CB in a home game 87-47. Winless AB Skikda lost to undefeated NAH Dey on the road 55-92. Very expected game in B.B. Arreridj where 11th ranked Olympi Miliana (1-3) was defeated by leader IRB Arreridj (4-0) 73-60 on Sunday. IRB Arreridj have a solid series of four victories in a row. They maintain first place with 4-0 record. Olympi Miliana lost third consecutive game. They keep the eleventh position with three games lost. Very predictable result when leader WO Boufarik (2-0) smashed at home 12th ranked Rouiba CB (1-3) 87-47 on Sunday. WO Boufarik moved-up to fourth place, which they share with GS Petroliers and NAH Dey. Rouiba CB lost third consecutive game. Newly promoted team dropped to the eleventh position with three games lost. Not a big story in a game in Alger where bottom-ranked AB Skikda (0-3) was rolled over by leader NAH Dey (2-0) 92-55 on Sunday. NAH Dey moved-up to fourth place, which they share with GS Petroliers and WO Boufarik. Newly promoted AB Skikda still closes the standings with three games lost.